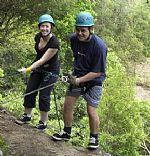 River Deep Mountain High Abseiling Rappelling based in Katoomba, NSW invites you to come learn the extreme sport of Abseiling and rappelling in the Blue Mountains' cliffs with qualified staff on hand to ensure a safe descent of cliffs and mountains. Abseiling Rappelling has become an adventure activity in it's own right and is a necessary skill for Canyoning, caving, military, even building maintenance, scientific field research and search and rescue operations. 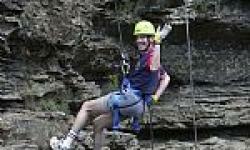 Come for the wild challenge of stepping off the cliff into the unknown as you head over the Blue Mountains sandstone cliffs and gently lower yourself down, and experience the thrill and exhilaration of a truly wild challenge. 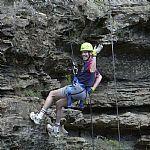 Choose from half day or full day Abseiling expeditions with the River Deep Mountain High Abseiling Rappelling adventure.